The famous Ring of Kerry! Ireland's best known secret flows westwards from the Lakes of Killarney. Walking the Kerry Way avoids the bustle, takes you into the mountains, above the roads and away from the masses. 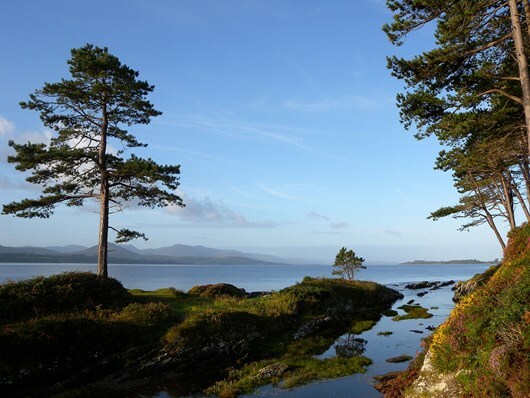 Hike the foothills of the Reeks, spectacular coastline scenery and stay in Killarney, splendid in its lakeshore location. The 11 day trail starts in the famous town of Killarney and walks through Killarney National Park and over the Lakes of Killarney to the remote Black Valley and Glencar. Rhododendron forests, old oakwoods and along the foot of Ireland's highest mountains to Glenbeigh where you meet day 5-8 of the 8 day tour. The Kerry Way follows old green roads, mountain trails and small country roads. There will be some walking on roads, as it is not always possible to walk in open country. It is well signposted with wooden or plastic yellow markers and road signs. DAY 1: Arrival in Glenbeigh Arrival in Glenbeigh, situated at the foot of a well-wooded mountain and close to the head of Dingle Bay. Overnight Glenbeigh. DAY 2: Glenbeigh to Foilmore19 kms/11.9 miles Walk Glenbeigh to Foilmore near Cahirciveen, with views over Dingle Bay. Overnight Foilmore. DAY 3: Foilmore to Waterville25 kms/15.6 miles Walk to Waterville over hills of 200-300m and overlooking Lough Currane. Overnight in Waterville. DAY 4: Waterville to Caherdaniel15 kms/9.4 miles Waterville to Caherdaniel via the coastal route to Derrynane - lovely village with great beach. Overnight Caherdaniel. DAY 5: Caherdaniel to Sneem19 kms/11.9 miles Walk Caherdaniel to Sneem on the "Old Butter Road". Overnight Sneem. DAY 6: Sneem to Kenmare22 kms/13.75 miles or 30 kms/18.75 miles Sneem to Kenmare via Tahilla and Blackwaterbridge, enjoying the views over Kenmare Bay. Overnight Kenmare. DAY 7: Kenmare to Killarne25 kms/15.6 miles Walk to Killarney through Killarney National Park on the "Old Kenmare Road". Overnight Killarney. DAY 8: Departure from Killarney Departure by bus or train from Killarney. The 12 day trail starts in the famous town of Killarney and walks through Killarney National Park and over the Lakes of Killarney to the remote Black Valley and Glencar. Rhododendron forests, old oakwoods and along the foot of Ireland's highest mountains to Glenbeigh where you meet day 5-8 of the 8 day tour. DAY 1: Arrival in Shannon or Cork. Transfer by bus to Killarney. Overnight guesthouse Killarney. DAY 2: 22 km/13.75 miles Walk Killarney to Black Valley, through Killarney National Park to finish at Brandon's Cottage. DAY 3:23 kms/14.4 miles Walk Black Valley to Glencar. Pass under the magnificent Magillicuddy Reeks and Ireland's highest mountain. Overnight Glencar. DAY 4:13 kms/8 miles Glencar to Glenbeigh, with views over Caragh Lake and Dingle Bay. Overnight Glenbeigh. Option 1: 8 Day: £565.00 per person sharing, £85.00 single supplement. Option 2: 12 Day: £795 per person sharing, £135.00 single supplement. 7 nights (or 10) Bed & Breakfast or guesthouse accommodation; luggage transfers each day; detailed route descriptions and maps. Other meals; transfers to and from Killarney; entries or excursions. SUGGESTED EXTRA OPTIONS Extra night in Waterville, to visit the Skellig islands with 5th century monastic remains and a bird sanctuary. An incredible place. AIRPORT FOR TRANSFERS Cork or Shannon, bus to Killarney. Kerry Regional Airport.